We’d love your help. 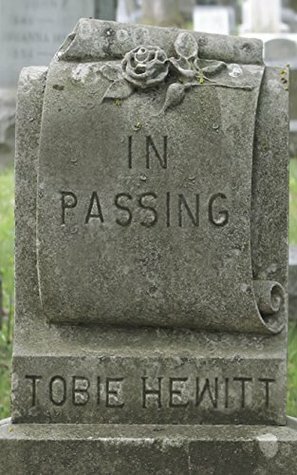 Let us know what’s wrong with this preview of In Passing by Tobie Hewitt. For a moment we live. For a moment we love. In a moment both life and love can pass away into the mist of another day. We celebrate and grieve in turn. But then, in another moment, both life and love can return, and if we stay aware, we can find both . . . In Passing. To ask other readers questions about In Passing, please sign up. 'In Passing' by Tobie Hewitt is a thought-provoking story that explores questions we often have about life, death, and how we find those soul mates we know we're meant to be with. The characters are just gorgeous, and the struggles they face are ones that the reader can easily identify with. This delightful book opens with one of the best opening lines I've read in a long time : "The air shimmered with a knowing beyond doubt." That line really made me stop and think, and visualise scenes where t 'In Passing' by Tobie Hewitt is a thought-provoking story that explores questions we often have about life, death, and how we find those soul mates we know we're meant to be with. The characters are just gorgeous, and the struggles they face are ones that the reader can easily identify with. This delightful book opens with one of the best opening lines I've read in a long time : "The air shimmered with a knowing beyond doubt." That line really made me stop and think, and visualise scenes where this could have been the case. From that moment, I was fully engaged with the story and completely hooked by Tobie Hewitt's writing.